Elixir Door and Metals Company Series 9000 Vinyl Steel Housetype doors are constructed from our thickest gauge of high quality vinyl laminated steel. Our high-quality adjustable stop wood jamb with an optional lifetime warranty weatherstripping. Series 9000 doors are equipped with a folded steel edge creating a double seal to protect against air, light, and water penetration. The Series 9000 features energy efficient polyurethane insulation, a drive-in swivel lock bolt, an optional deadbolt, and a 3-fin vinyl sweep. The storm door with a built-in drip cap comes in three options: conventional, all glass full--view, and full-view. The storm door is 1-1/8" thick with 1/8" tempered safety glass. The storm door is available in three colors: mill, white, and bronze. 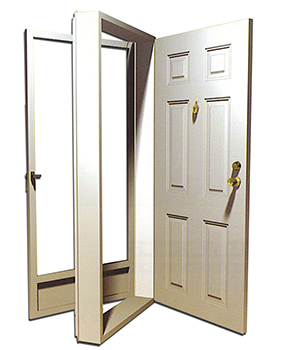 The Series 9000 door is available in white only but comes in several different sizes. Add beauty to the home with a selection of door lite options. The decorative glass comes with a ten-year warranty. Please contact your local Elixir Divisionn to inquire about Elixir Entrance Doors.